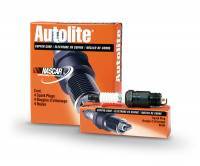 Autolite has been the Official Spark Plug of NASCAR since April 2000. Autolite® Copper Core Spark Plugs. Guaranteed to deliver quick starts, good fuel economy and smooth acceleration. Autolite® Copper Core plugs are your industry standard. Autolite® Racing Hi-Performance Spark Plugs. Actual racing spark plug used by many professional car drivers. Provides cut back ground electrode, anti-corrosive nickel plating and large ground electrode for better heat transfer. Pit Stop USA is The Online Motorsports Superstore! We feature Spark Plugs at low everyday prices. Check out the Recently Listed Spark Plugs. Pit Stop USA is The Online Motorsports Superstore! Since its inception, the Autolite brand has provided the automotive aftermarket and Original Equipment manufacturers the highest quality ignition products. The birth of Autolite began in 1911 when two small companies started producing buggy lamps, and became a thriving automotive parts manufacturer by the 1930s. But its history as a spark plug manufacturer began in 1935 when Royce G. Martin, President of the Electric Autolite Company, equipped and staffed a lab to develop the first Autolite spark plug. Leading the project was Robert Twells, a ceramic engineer, who eagerly researched current patents and ceramic insulator technology. With a handful of new draftsman and staff members, it only took a few months before the Electric Autolite Company had a spark plug available for distribution. Autolite had instant success, as the brand supplied spark plugs and other ignition parts to well-known automotive leaders including Chrysler, Studebaker, Packard and Willys. Among its wide range of spark plugs for automotive and small engine applications, Autolite is known for its Double Platinum spark plugs. These plugs are up to 30 percent more durable than the average of leading competitors and provide optimal performance longer than a standard spark plug. Autolite employs state-of-the-art process control and automated inspection equipment to assure that products are made on time and meet rigorous internal and customer requirements. Autolite racing spark plugs are used by many professional race car drivers today. Provides cut back ground electrode, anti-corrosive nickel plating and large ground electrode for better heat transfer. Autolite has been the Official Spark Plug of NASCAR since April 2000. We feature Autolite Racing Spark Plugs at low everyday prices.